Depreciation rates are based generally on the effective life of an asset unless a write-off rate is prescribed for some other purpose, such as the small business incentives. All other depreciating assets require a useful life estimate. How long an asset is considered to last, its “useful life“, determines the rate for deducting part of the cost each year. some kinds of assets have a prescribed depreciation rate – a number of those are set out here. you use a determination of effective life for which tables are updated and published annually by the Tax Office (see discussion below). The ATO makes its determination of effective life for different kinds of assets after research into how long it will take for them to wear out according to an assumed usage level. The effective life, measured in years, will naturally depend on the kind of asset, how it is used and the conditions it is subjected to. For a depreciation claim, the effective life in years is converted to an annual percentage rate, based on one of the two depreciation methods outlined below, or using the effective life conversion spreadsheet which is offered at the foot of this page. When the percentage rate is applied to the cost, or remaining cost, of an asset the dollar amount calculated the deductible depreciation amount. The effective life for an asset can be looked up in a number of ways. Here’s another online tool which is easy to use and based on the latest effective life ruling. See the Free Australian Tax Depreciation Rate Finder here. Download the effective life Ruling (pdf) and perform a document search (explained in detail below). When choosing to use the Commissioner’s estimate of useful life ensure that the schedule chosen is applicable to the year the asset was acquired. The applicable Ruling for an asset is the one covering the period in which the asset was acquired. To manually locate assets from the tables in a pdf document use the search function as follows. The effective life schedules have two tables, referred to as Table and Table B. Table A is for specific industries. Start here. 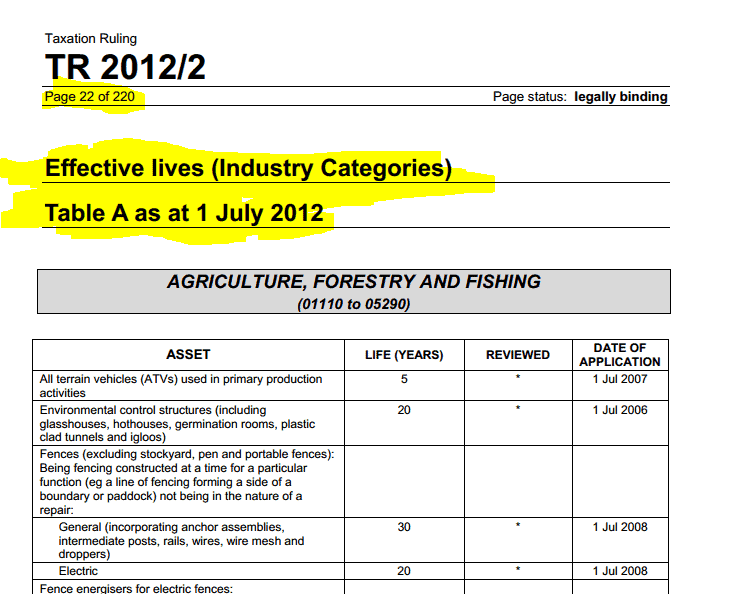 If you belong to one of the industry categories listed, then you must use the effective life for the assets listed. If you’re not in that industry, or if the particular asset is not listed, then you need to go Table B. 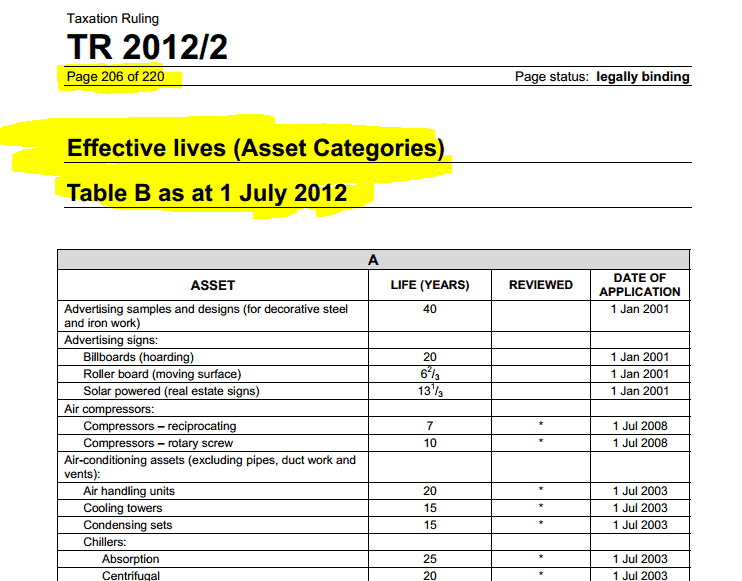 Table B – is a listing of asset categories, and is to be used when your industry is not listed under Table A, or if it is, the particular asset you are looking for is not there.If the asset also can’t be found in Table B, then you have no choice but to use the self-assessment method to determine the effective life. Using the PDF formatted versions of the Commissioner’s effective life tables enables them to be viewed in Adobe Acrobat Reader (or a similar reader) which are searchable for specific text. Step 1. Search Table A first. If the asset is not in Table A, then.. Step 2. Search Table B. If the asset also can’t be found in Table B, then.. Step 3. the self-assessment method of determining effective life must be used. Having found an asset under the industry listing (Table A) or in Table B, the Effective Life tables provide a single number. That number is the Commissioner’s estimate of effective life in years. That determination in years forms the basis of a depreciation calculation which allocates the asset cost over the years of its useful life. That cost allocation is the nominal deduction. (Only “nominal”, because if the asset has some private use for example, some further adjustment may be required). The diminishing value method results in higher depreciation claim amounts in the earlier years of asset ownership. The term ‘Base Value’ is initially cost, but this can be modified by later improvements and the forgiveness of commercial debts. Under the Diminishing Value method, the depreciation for each successive year is calculated on the Base Value reduced by the previous year’s claim amount. The Cost and calculation may be later modified by a recalculation of effective life, later improvements, forgiveness of commercial debts, application of rollover relief, GST and currency adjustments. Note also that where motor vehicles are concerned, luxury cars have an upper depreciation limit. If you need a hand with the conversion of effective life in years to a depreciation percentage, we’ve built a simple spreadsheet in MS Excel which does the job. (PC windows versions only). The calculator converts number of years to a depreciation percentage rate so you can get an actual depreciation claim amount in dollars. 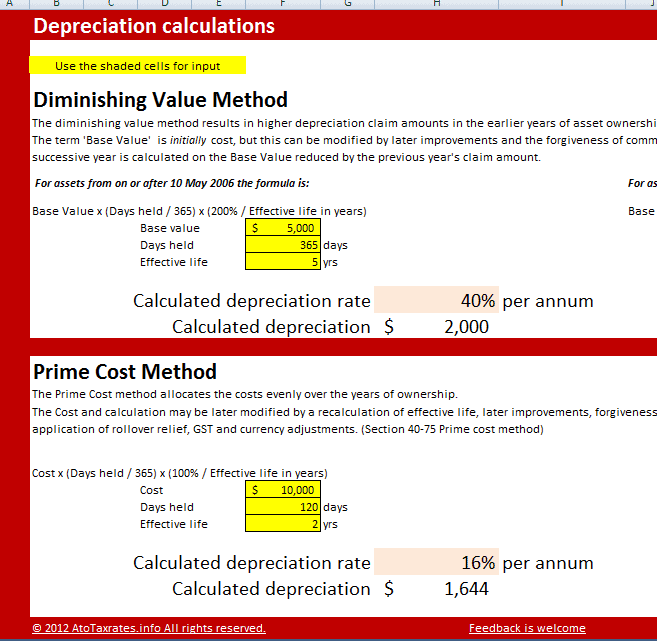 You can also see the comparison between the Diminishing Value and Prime Cost calculation methods. Immediate download: On completion of your payment your browser will be sent to a download link, and an email containing the link will be sent to your payment address.